Rev. 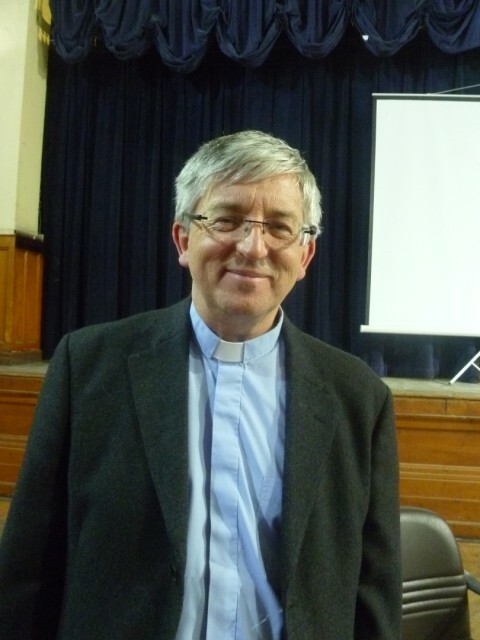 Stephen Sizer, a renowned expert on Christian Zionism delivered a series of lectures in Egypt at Cairo University, the Anglican Cathedral, and other venues. This article is a summary of his presentation delivered on February 15, 2012. According to Sizer, Christian Zionism is the view that the modern state of Israel is the fulfillment of Biblical prophecy and thus deserving of our moral and political support. Sizer opened with a brief history of Zionism, tracing its first political sponsor to Napoleon, who wished to wrest Jewish banking favor away from the British Empire in their struggle for supremacy. Britain eventually emerged triumphant, and then engaged Germany in the lead up to World War I, as both sides solicited Jewish favor in exchange for their support for a return of Jews to Palestine. The Belfour Declaration in 1917 was the pinnacle of Britain’s promise, set in the context of many geopolitical maneuvers with both Jews and Arabs. The Christian element of Zionism received a great boost with the election of President Jimmy Carter in 1976, who believed the state of Israel represented the fulfillment of prophecy. During this time Rev. Jerry Falwell emerged as the leading advocate of Christian Zionism, and promised 70 million evangelical Christian votes for supporters of the cause. After his death in 2007, Rev. John Hagee received his mantle, promising 50 million evangelical Christians would stand side-by-side with the 5 million Jews of Israel. Today, Sizer estimates 25% of US Christians identify with Christian Zionism, though this contrasts with only 5% of Christians worldwide. The consequence of Christian Zionism, Sizer noted, was the destruction of the church in the Middle East. Historic Arab Christian communities are being squeezed by the competing powers of Zionism and Islamism, finding no place for themselves. Many are immigrating. Former Archbishop of Canterbury George Carey warned that the holy sites of the Middle East could be transformed into a Christian theme park, in which the only Christian witness is carried by tourists and pilgrims. We reject the teachings of Christian Zionism that facilitate and support these policies as they advance racial exclusivity and perpetual war rather than the gospel of universal love, redemption, and reconciliation taught by Jesus Christ. Rather than condemn the world to the doom of Armageddon we call upon everyone to liberate themselves from the ideologies of militarism and occupation. Instead, let them pursue the healing of the nations! We call upon Christians in churches on every continent to pray for the Palestinian and Israeli people, both of whom are suffering as victims of occupation and militarism. Israel can succeed in being a democratic Jewish state if it gives up the territories to an independent Palestine. Greater Israel can succeed in being a democracy should it incorporate the inhabitants of Palestine as full citizens with equal rights, if it gives up its Jewish nature. Or, Israel can succeed (?) in being a Jewish colonial state, but only at the expense of giving up its democratic nature. Sizer’s presentation was warmly received by the majority of attendees, many of whom were less than familiar with this largely American religious phenomenon. The only issue taken with Sizer was his acceptance of the term, Christian Zionism. Some angrily rejected the coupling as an oxymoron – Zionism is not Christian at all. Rev. 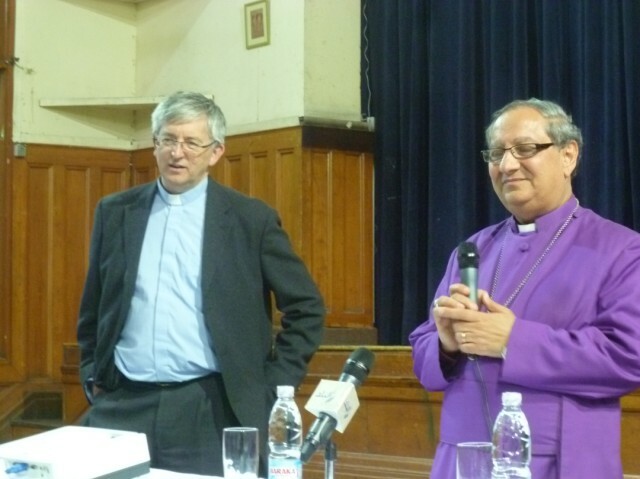 Sizer and Bishop Mouneer, who provided translation into Arabic. I wince when issues of the world are reduced to banking and Jewish conspiracies. Sizer does not take this bait and run with it, but much of anti-Zionist discourse does. Still, ‘follow the money’ is a truth worth reflecting upon, but surely historic world capital has been available via other than the Jewish ‘cabal’, no matter how disproportionate Jewish influence might be relative to their population. Yet from my superficial studies of world Judaism, I believe that for most of modern history the majority of Jews have been anti-Zionist themselves. Before the creation of Israel they waited for the advent of the Messiah to restore their fortunes to Jerusalem. Furthermore, many deemed Zionist efforts to be counter-productive to the social necessity of proving themselves loyal citizens to the nations in which they lived. Why then would Jewish bankers wish to swing worldwide sentiment to creation of a Jewish state? Far more research than I have done is necessary to determine the validity of the question, but however it is sliced, Zionism is a peculiar entity. As per Christian Zionism, I wish to recognize first that few evangelicals I am familiar with would use this phrase as a self-appellation. It is not a movement, however much it is a sizeable theological-political sentiment. Moreover, its sympathizers are good Christians, contra the disbelief of some who commented at the close of the lecture. Money given to support poor Jews in Russia may be manipulated politically, but it comes from a generous heart to help ‘the least of these’, as Jesus commanded. One omission from this particular lecture of Sizer was an evaluation of the Biblical sources. Why is Christian Zionism faulty interpretation? Its proponents certainly name chapter and verse to demonstrate the grand plan of God. Sizer’s website contains resources to address this question, as do the writings of Colin Chapman. I do not wish to enter into this discussion here, but it will suffice to say I recognize many of the principles of Christian Zionism, or of dispensationalism, its theological underpinning, as worthy Biblical options for interpretation. Christians disagree over interpretation all the time – what is important is that a common reference point judge between disputants. Both sides appeal to scripture, and therefore must not be excluded as the enemy, even if in error. For me, the definition of Christian Zionism as given by Sizer contains the key to its essential error. Modern political Israel may or may not be the fulfillment of Biblical prophecy. Yet even if it is, this should not translate into the necessity of moral and political support. Rather, it is the principles outlined in the Jerusalem Declaration that must guide Christian evaluation of Israel, as of all nations, including their own. Do the policies of a state nurture or hinder the flowering of love, justice, and reconciliation? Careful reading of the news is necessary, but in many cases the government of Israel violates these values. When it does, Christians must object. The Bible maintains that it was God’s anointed hand and the fulfillment of prophesy which smashed the Jewish state via the scepter of wicked Babylon in 586 BC, and then again by the Roman Empire in 70 AD. That this was God’s design did not call on the people to approve, only not to stand in the way. On the contrary, in the case of Babylon God promises he will judge its rulers for their injustice and oppression. Is God moving history toward a final confrontation between the world and Israel during which Jesus will return and inaugurate his kingdom? Perhaps. Those who scoff would do well to view events through this particular interpretive lens and gauge the odd correspondence. Why else would such an unimportant piece of land command attention of the whole world? Yet even if this vision is true, God will hold Israel’s leaders to account for their conduct – not based on political exigency, but on divine righteousness. He will hold Christian Zionists to account all the same. He will, in fact, judge the world. note: Please click here for a five minute video of Stephen Sizer giving an interview to a member of the Arab media after his presentation. Due to sound quality the questions were edited out, but should be clear enough from his answers given, which are presented in full. God loves Israel. God’s call to Abraham in Genesis 12; 1-3 is the beginning of salvation history, and includes both universal and specific promises. For example, Psalm 105; 7-11 and Jeremiah 31; 35-37. This is because his love for Israel is the first expression of his love for all humanity. His eternal promises to Israel are not in conflict with this, but are a guarantee of it (Romans 11:16). They were called to be a nation of priests (Exodus 19:6), to show God’s ways to the rest of humanity. Israel were called because God loved them (Deut 7: 8), rescued from slavery, given God’s laws and a good land, yet with all this they still sinned. They sinned to the point of killing his own dear son, Jesus. Israel shows us that we cannot make it to God through our own efforts, even with God’s own care and help, yet we fail. Now, is that then the end of the story, God’s love and promises thwarted by our weakness and sin? NO!, for as Paul tells us, in his discussion of Israel, “the gifts and calling of God are irrevocable.” God’s love is greater than our sin. Israel are saved when, as we find in Zechariah 12-13, they look on him whom they have pierced (conviction of sin), the mourn for him (repentance), and a fountain is opened for them for the removal of sin (baptism). That is, they are saved just the same way you and I are, just as they showed that we cannot reach God in our own strength, that the wages of sin is death, so they show that the free gift of God is eternal life, when all the nations of the earth come against them, they show the world the way of salvation (see above), and so fulfill their calling as a nation of priests (Zechariah 8:20-23). At present, they have been re-gathered in unbelief, just as Scriptures says, are still sinning, just as you and I are, and need the gospel. At the same time, when I sin, when I let God down, when I wonder if God could ever forgive and use me again, I look at re-gathered Israel and take hope. If God has not given up on them, he will not give up on me. As a gentile Christian, I am glad God has re-gathered Israel, that he still cares for them and is working for their salvation. Thank God for the modern miracle, the nation of Israel! I’ve studied Christian Zionism myself, and I don’t recognise the description given here. The vast majority of the Christian Zionists I know support Israel because they believe (1) she has a historic and legal claim to the land (2) the church needs to atone for 2000 years of antisemtism and (3) the Bible supports their position. Sizer is basically using straw man arguments rather than addressing the real issues. The only democracy in the middle east is Israel. The only country in the middle east where christians are safe is Israel. Israel should be celebrated, not condemned. Tony and Colin, thank you both for your comments. I appreciate your perspective and I hope readers will also. God bless. Just a thought – could you somehow tweak the settings on this website to improve the appearance of the comments. On my computer at least, they’re in a tiny font size and have been converted to all capitals, both of which make them very hard to read. Sorry, Tony, it is the WordPress setting and I don’t know the html to change it. I’ve looked into settings for it but I think that is the way it is. I saw Sizer speak in Amman several years ago, and while sympathizing with much of his perspective, I wondered what the point was of his coming here, where everyone would already agree with his perspective, and where more fuel for the fire–so to speak–was not really necessary. Also, as with any nation, Israel should be condemned when violating basic human rights. The Old Testament is filled with examples of prophets condemning Israel for various wrongs; I see no reason why as a nation they should be exempt from criticism today. Finally, the only reason people think Israel is the only country in the Middle East where Christians are safe is because it is repeated so often. It must be true, because everyone says so, right? Just last month, though, a church in Jerusalem was vandalized by an extremist settler group who spray painted such whimsical phrases as “Death to Christianity” and “Jesus son of Mary, the whore.” Also, during the Christmas season a bus of Christmas carolers from Bethlehem Bible College was attacked by rock throwing Jewish settlers. These are just examples I knew about off the top of my head, but they give the lie to the belief in the relative safety of Christians in Israel. With respect, you again are using straw man arguments. I’ve never encountered a Christian Zionist who believes that Israel is perfect or shouldn’t be criticised. The concern is when Israel is held to a standard not expected of other countries, or singled out for criticism whilst other countries are ignored. There’s a video on YouTube by Alan Dershowitz where he asks the question “name one country in the whole history of the world that, when faced with comparable threats, has showed more respect for human rights and the rule of law than Israel”. The answer is that there isn’t one. Your second point also is a whitewash. Of course Christians in Israel are subject to some discrimination and persecution. The same is true in many western countries as well. But if you were a Christian in the middle-east, which country would you prefer to live in? An Islamic theocracy or Israel? I know what I’d choose. If by a straw man argument you mean I am misrepresenting the beliefs of Christian Zionists, then I have to disagree with you. This is because–in speaking at dozens of churches and church groups in the USA over the past year–I have absolutely met numerous Christians who believe Israel is at least near perfect and should not be criticized. In fact, in my experience, that was the norm. So, what we are both doing is not using straw men but anecdotal evidence to argue our points. My anecdotes are apparently different than yours, but to say you have “never encountered” these types of Christians does not mean they don’t exist. The comment by Dershowitz works well in a vacuum, without any appeal to the historical context of the conflict. However, Israel was created at the expense of the Palestinian people, with hundreds of thousands losing their homes at gunpoint, and many losing their lives. Almost everyone I know in Amman has a story about losing their home–yes, even Christian Palestinians I know. Ask these people about the threat they faced when that happened, and ask them about the threats still ongoing to those still there, as further encroachments on the land occur on a regular basis. Ask them about the respect for human rights and the rule of law that they were shown. I don’t agree with the violence used to retaliate, but such a response is not exactly unprecedented in the history of the world when others have faced similar situations. As far as my second point being a whitewash, I’m not sure exactly what I am covering up. Your original comment said that Christians were safe in Israel–unlike in the rest of the region–not that they were less discriminated or oppressed. So, I responded to the assertion that they were, indeed, safe. And since you indicated your desire for Israel to be held to the same standards as any other nation, let’s not compare them to the grim standards of the region, but rather to the world at large, and to the ideals that we’d like to see the world over. Finally, sorry, Julie and Jayson, to use your blog for my screeds. I guess it’s just been a long time since I’ve argued via computer with a stranger. No problem, Matt, and Tony, I’ve enjoyed reading along and I’m sure others have also. I appreciate it.